The following contains the shared document for the development of the Social Media Policy Toolkit, a shared service of the Federal Social Media Community of Practice lead by teams including The Department of Labor’s Office of Disability Employment Policy. The toolkit is intended to help agencies evaluate the accessibility of their social media programs for persons with disabilities, identify areas that need improving, and share their own ideas and recommendations for helping ensuring our modernization programs are easily accessed by all who need them. In this shared document, collaborators are encouraged to identify best practices in improving the accessibility of social media for public services, or create a new and better way (though copy and pasting the content in, or linking directly to pre-existing content). Government agencies are increasingly using social media to engage with citizens, share information and deliver services more quickly and effectively than ever before. But as social content, data and platforms become more diverse, agencies have a responsibility to ensure these digital services are accessible to all citizens, including people with disabilities. 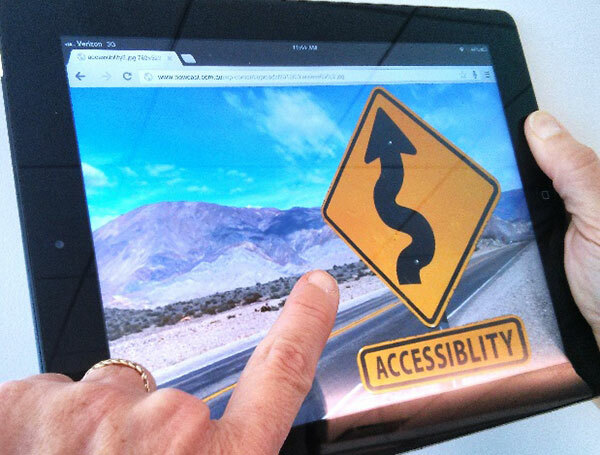 This Toolkit is your guide to Improving the Accessibility of Social Media for Public Service. Created with the input of social media leaders and users across government and the private sector, this living document contains helpful tips, real-life examples and best practices to ensure that your social media content is usable and accessible to all citizens, including those with disabilities. Improving the Accessibility of Social Media for Public Service is brought to you by the U.S. Department of Labor’s Office of Disability Employment Policy (ODEP), the U.S. General Services Administration’s Office of Citizen Services and Innovative Technologies and the Social Media Accessibility Working Group, a committee within the Federal Social Media Community of Practice. Working together, these entities have aimed to curate and share best practices to help agencies ensure their social media content is accessible to everyone, including users with disabilities. Efforts are also being made to work with social media platform and tool developers, citizens and partners to encourage greater accessibility. The genesis of this Toolkit is a collaborative document that originated at the #SocialGov Summit on Accessibility, which is a product of eight agencies: U.S. Geological Survey, Environmental Protection Agency, Department of Labor, Department of Transportation, National Oceanic and Atmospheric Administration, National Cancer Institute, National Human Genome Research Institute and the General Services Administration. Also included is input from “Sociability: Social Media for People with a Disability,” by Dr. Scott Hollier, Western Australia Manager for Media Access Australia (MAA) and member of the Advisory Committee of the World Wide Web Consortium (W3C). Why Is The Accessibility of Social Media So Important? The Labor Department’s Office of Disability Employment Policy (ODEP) and the Federal Social Media Community of Practice are deeply invested in the issue of accessible technology. Why? Because the development and adoption of accessible, universally designed technology is critical to making sure people with disabilities succeed at work and deliver for their employers. Think about it—could you do your job if it wasn’t possible to read your email? And could you even get a job if you couldn’t fill out the online application? If you can’t access the tools and technologies you need to look for or perform a job, your employability and productivity suffer. So it’s easy to understand why inaccessible technology can be a major barrier to employment or on-the-job success. This same logic applies to social media. More and more organizations are using social media to conduct outreach, recruit job candidates and encourage workplace productivity. According to a survey conducted by the Society for Human Resource Management, as of 2016, 84% of organizations are using social media as a recruiting tool. But not all social media content is accessible to people with certain disabilities, which limits the reach and effectiveness of these platforms. And with 20 percent of the population estimated to have a disability, government agencies have an obligation to ensure that their messages, services and products are as inclusive as possible. So put simply, the accessibility of social media—or any product or IT offering—is everyone’s responsibility. And it is vital that the federal government promote accessibility in all of its technology efforts. After all, an effective and responsive government depends on citizen engagement as well as a diverse, well-prepared workforce. And both of these require access to information and technology. In addition, there are many ways users access and participate in social media. Though this toolkit is not meant to address the needs of social media users, we encourage users to be part of the conversation in order to provide guidance to those who are trying to effectively reach them. Below is a set of recommended, baseline strategies to improve the accessibility of government social media. List a primary phone number and email address where a user can reach your agency with questions, or provide a link to your agency website that lists the appropriate contact information. Make your social media content available through more than one channel. Provide easy points of entry for more information. Some of the most common ways are to post threads on your website, provide options to sign up for daily email digests of social media posts or to add a social media widget to your agency website. **Provide links or contact information to official social media support and accessibility teams. ** Often, social media tools have their own accessibility tips and support help desks. Educate yourself about them and provide links to your constituents. 4. **Keep it simple. ** Good design and good content more often than not leads to accessible content. When possible, write in plain language, use camel case when appropriate (i.e., capitalize the first letters of compound words as in #SocialGov), and limit your use of hashtags, abbreviations and acronyms. The use of camel case is not only a common practice, but a helpful one as it makes multi-word hashtags easier to read, including for those using a screen reader. 5. **Learn the accessibility requirements and periodically test your content for accessibility. ** Read the Section 508 Standards and the Web Content Accessibility Guidelines (WCAG) 2.0 and other key resources that discuss them. Then test your social media content with a screen reader or other type of assistive technology. The federal government is full of acronyms. Don’t assume your audience is knowledgeable about all acronyms. Take advantage of the space Facebook provides and always spell out the first instance of the acronym and add the acronym, in parentheses after (e.g., Social Media Emergency Management (SMEM)). This is especially helpful for those using screen readers, because after the name is heard and the acronym is spelled out, the user will be better able to associate the sound of the acronym with the full name. Enable the setting on Twitter to use the “image description” feature, which will allow you to to add a descriptive caption to any photo that you directly include in a tweet. For step-by-step instructions on enabling the image description feature on the web and on iOS and Android mobile apps, please visit https://support.twitter.com/articles/20174660. Provide recaps of Twitter Chats. For example, the U.S. Department of Labor provided a detailed recap of its Twitter #VetsJobChat through a post on its (Work in Progress) blog. Storify.com is a popular web platform that allows users to compile tweets on a particular topic or hashtag. Here’s the step-by-step guide USA.gov uses for improving Snapchat accessibility. Note that good captions are not just a transcript of what is said in the video. It is also important to describe sounds, particularly sounds for which there is no visual equivalent (e.g., if someone in a video is giving a talk, and the viewer can’t see that the audience is laughing, the captions should say that people are laughing). Tone of voice is also important to note, particularly if not obvious from a person’s facial expression (or if the person’s face can’t be seen). A lot of meaning and information can be missed by certain viewers with hearing or cognitive impairments if they are not made aware of sounds, tone of voice, etc. ; the way the meaning of spoken content is interpreted can completely change based on this information. Knowing that the background music is cheery, for example, helps signal that the producers mean for the scene to be viewed in a light way and can help shape viewers’ expectations for the kinds of things that will follow. Someone saying “I’m doing great” in a sarcastic tone clearly means something very different from someone saying it in a casual or light tone. Information conveyed in the video must also be explained in screen text or audio (i.e. if someone is making a sandwich and there is no audio then there should be a text or audio equivalent to explain the action taking place in the video). Instagram does not allow users to add closed captions to videos, so users should provide a detailed caption that describes what is happening in the video and includes a transcript of what is being said in the video. Upon uploading a video clip, add a transcript to cover spoken and visual action to Vine’s “description” field. Remember that in addition to including captioning for individuals who are deaf or hard of hearing, information that is conveyed visually needs to include descriptive text readable by screen readers for individuals who are blind or who have low or limited vision. Alternatively, Vine videos can be embedded in a website where they can be captioned and described. ** ** Closed-caption can be embedded Vine video on your website using a tool like the JW Player. Choose a blog template that has few columns and a simple layout. The layout should be consistent across all pages of the blog so as not to confuse users. The blog’s design should have enough color contrast between the background and the font for ease of reading. Avoid using colors that clash and try to avoid using green, blue and yellow too close together. Black text on a white background is preferred. Set up your blog on an appropriate blogging platform. WordPress.com, and Blogger are two of the most popular options for bloggers because they are easy to customize. WordPress offers many free plugins and allows you to host a page on your own server, giving you more freedom to customize the software for accessibility. If you wish to have a blog roll (list of blogs you follow), social media feeds or a list of past posts, place those to the right side of the template. If you must include navigation or other links on the left side of your blog, insert a skip link so the information that is repeated on every page can be bypassed. To read about inserting a skip link – http://www.afb.org/info/accessibility/tips-and-tricks/25#skiplink. Add alternative text and captions to all images on the blog and within posts. Link to videos and audio components, and include transcripts of all video content. Ensure that sounds and video do not play upon a page loading – give users the choice to press the play button. Text such as “click here” or “read more” can make it difficult for people with screen readers to understand where a link will take them. Instead of these short phrases, hyperlink fully descriptive text so that users will know where they are going when they follow a link. For example, use the full title of an article or Web page to which the link will direct readers as the hyperlink text. Additionally, allow links to be opened in the same window so users can navigate with the “back button” as needed. Make sure that links are indicated by more than just a change in color so that visitors to your blog are clear that they have encountered hyperlinked text. Keep your writing simple. Use plain language and write in the active voice. Break up long paragraphs into smaller chunks of text. Although Tumblr is considered a popular micro-blogging and social media tool, many users with disabilities find it difficult to navigate, but there are some ways to help make this easier. Tumblr is image-heavy, so as with all Web content, alternative text should be used. Many users suggest posting images using the text post option, rather than the image post option. In the image option, any text entered as a caption is read twice by screen readers. The use of GIFs on the site can also be difficult for individuals with sensitivities to flashes. Either limit their use or make sure than any visual element that blinks or flashes at a rate more than three flashes per second is small enough to only cover a quarter of an individual’s field of vision. Depending on your social media strategy, you may want to use other platforms such as LinkedIn or Pinterest to connect with constituents. LinkedIn focuses on professional contacts and also allows users to collaborate and share articles and ideas through its group message boards. Your LinkedIn profile should have a clear image to accompany your name so users can distinguish you from other potential contacts with a similar name or brand. Pinterest is a visual discovery tool where users create online “bulletin boards” of images, ideas and videos. All Pinterest content is “pinned” to boards from outside sources. Include a description of the item you are pinning and alert users if it is a picture, video, audio file or GIF (e.g. [PIC], [VIDEO], [AUDIO], [GIF]). If you are pinning content that you did not create or is not accessible, make sure your audience is aware of these limitations by including a brief note in the description of the pin. As with Vine videos, Instagram videos should have captions and a transcript. For more information on video accessibility, read the Tips for Making YouTube Videos Accessible and Tips for Making Vine Posts Accessible. The recommendations in this Toolkit are presented in a “living, open document” designed to progressively evolve based on continuous feedback from all areas of social enterprise, as new methods and tools become available. Agencies, organizations and citizens are encouraged to expand this content by adding recommendations and new tools and tips. They are the beginning of a shared inter-agency approach to this emerging field—one that will allow agencies to collectively advance toward better accessibility to public services through social programs for citizens.